Researchers at the University of California, San Francisco (UCSF) say they have designed a large-scale screen that identifies drugs that are potent cancer-killers when combined, but only weakly effective when used alone. Using this technique, the scientists eradicated a blood cancer and certain solid tumor cells by jointly administering drugs that are only partially effective when used as single-agent therapies. The effort, a cross-disciplinary collaboration between UCSF researchers, is described in a study (“High-Complexity shRNA Libraries and PI3 Kinase Inhibition in Cancer: High-Fidelity Synthetic Lethality Predictions”) in Cell Reports. “Deregulated signal transduction is a cancer hallmark, and its complexity and interconnectivity imply that combination therapy should be considered, but large data volumes that cover the complexity are required in user-friendly ways. Here, we present a searchable database resource of synthetic lethality with a PI3 kinase signal transduction inhibitor by performing a saturation screen with an ultra-complex shRNA library containing 30 independent shRNAs per gene target. We focus on Ras-PI3 kinase signaling with T cell leukemia as a screening platform for multiple clinical and experimental reasons,” the investigators wrote. When scientists developed the first targeted cancer therapies (drugs that interfere with specific biological circuits that cancer depends on for growth and survival) many thought they had finally cornered cancer. But cancer is a clever disease that can outwit these precision medicines by “rewiring” itself to sidestep the circuits switched off by these drugs, according to Jeroen Roose, PhD, professor, department of anatomy at UCSF and senior author of the new study. “Many cancers either fail to respond to a single targeted therapy or acquire resistance after initially responding. The notion that combining targeted therapies is a far more effective way to treat cancer than a single-drug approach has long existed. We wanted to perform screens with saturating coverage to understand exactly what combinations should be explored,” said Roose. Scientists have found that when they target two distinct circuits with two different drugs—each of which is inadequate on its own—the aggregate effect can be greater than the sum of its parts. 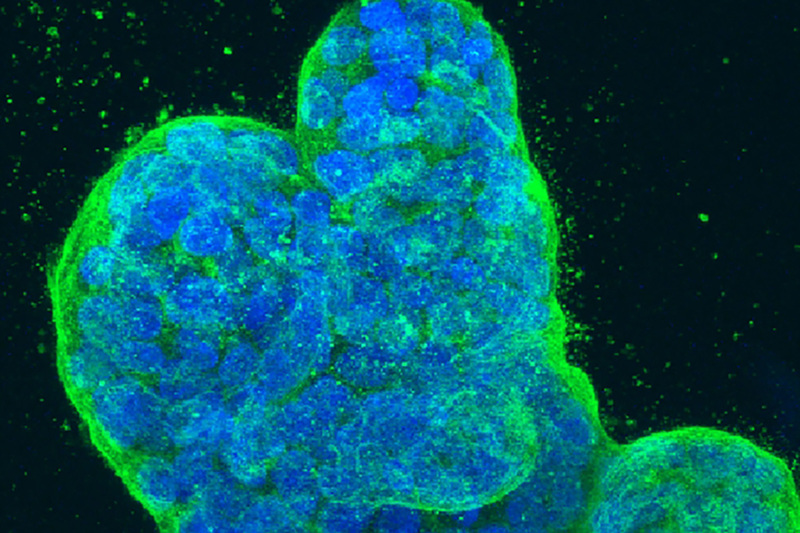 However, figuring out which drugs can synergize to kill cancer remains a challenge. To demonstrate the power of their screening system, the scientists searched for targeted therapies that could join forces to kill an aggressive blood cancer—T cell acute lymphoblastic leukemia (T-ALL). Their hunt began with a drug that targets PI3K, an enzyme that promotes the growth of many cancers, including T-ALL. Though drugs that target PI3K already exist, the current crop of PI3K inhibitors can slow, but normally can’t kill, this type of cancer. “Nearly 65% of T-ALL patients have hyperactive PI3K, but most patients will likely not be cured by single-drug treatments. We wanted to find drugs that would kill T-ALL when combined with a PI3K inhibitor,” said Roose, a member of the UCSF Helen Diller Family Comprehensive Cancer Center. To find those drugs, the researchers turned to RNA interference (RNAi) to massively reduce the activity of specific genes. The discovery of RNAi, which occurs naturally in all animals and plants, and is now widely used in research, was a major breakthrough that was recognized with the 2006 Nobel Prize in Physiology or Medicine. CRISPR has made it possible to completely remove genes. But according to McManus, while eliminating a specific gene is the gold standard, an essential first step in determining its function in cells at times, reducing a gene’s activity level using RNAi activity may be more desirable. This is especially true, he says, when researchers are seeking to mimic the effects of drugs, which often reduce the activity associated with a particular gene without completely eliminating it. “When searching for cancer drugs, for example, RNAi may do a better job of approximating precision therapies, both of which only partially inhibit their biological targets,” McManus said. The researchers have also started exploring CRISPRi and CRISPRa—modified forms of CRISPR that inhibit or amplify the activity of target genes, respectively, without making cuts to the DNA—for these reasons. Roose and McManus aren’t the first scientists to use RNAi to search for these kinds of combinatorial therapies. But earlier efforts were error-prone because those screens used RNAi libraries that were too small, Roose said, adding that what sets the new study apart is the ultra-complex collection of short hairpin RNAs (shRNAs) that were used. These RNA fragments contain sequences that correspond to those found in messenger RNAs (mRNA). When an shRNA finds an mRNA that contains a matching sequence, the two molecules bind together to initiate a process that destroys the mRNA and inhibits the activity of that gene. In total, the researchers targeted some 1,800 cancer-associated genes with approximately 55,000 shRNAs, or about 30 shRNAs per gene, “more than enough to eliminate false positives and false negatives,” Roose said. The screen itself involved growing two different human T-ALL cell lines in the presence of PI3K inhibitors and then simultaneously administering shRNAs to find out which genes, when silenced in the presence of these drugs, killed the cancer. From this screen, the researchers then focused on 10 genes whose activity, when curbed with precision medicines, was predicted to kill T-ALL cancer cells in combination with PI3K drugs. They tested these predictions and found that nine of the combined therapies could kill T-ALL, a feat that none of the drugs could achieve on its own. The researchers then tested the most effective of these synergistic drug combinations on mouse models of T-ALL and found that it could extend survival by 150%. The screen also yielded a digital tool that Roose says will be useful for other researchers: a user-friendly, searchable database based on results from the screen. The search engine, developed by Marsilius Mues, PhD, a former Roose lab postdoc and lead author of the new study, produces mansuscript-quality figures that help researchers identify genes that emerged from the screen as potential targets for combination therapy with PI3K inhibitors, noted Roose. Recognizing that discoveries made in blood cancers don’t always translate to solid tumors, the researchers also tested the predicted drug combinations on 28 solid tumor cell lines derived from human breast, colorectal, pancreatic, and brain cancers. They found that even in these solid tumor cells, the combination therapies synergized to reduce the number of cancer cells by up to 20% over the course of the experiment. “An important message from our work is that scientists can use leukemia cells as a platform to find drug combinations that also work in solid tumors. Our screening platform is very generalizable,” Roose said.